RSVP soon, as space is limited!! Have you been feeling a deep desire to reconnect with your authentic voice, power and presence in your own life? A yearning for true, deep connection with other women? A pull to truly nourish yourself in a way that gives you solid ground to stand on and yet guides you towards something greater than yourself? To give in a way that also fills YOU up? Come and see the most beautiful, empowered, true version of yourself mirrored in the eyes of those around you. Come and allow yourself to dream, receive, and tap into your most precious desires in a community that will help them to grow, and allow yourself to Rise. It is time for women to come together! Time for us to Rise! Hand-in-hand with the Earth's evolution, we can support her, and ourselves, while receiving that support on a deeper level than we've imagined possible. The time is now, the women are here, for our dreams to come forth as we create a space for our inner voice... ...and Really. Listen. Come and be supported, held and nourished by the healing energy of ancient Pine Trees, a nurturing Sisterhood Community and the magical energy of the New Moon. Experience Yin Yoga, Tree-sitting practice with QiGong, Sound Healing with Guided Visualization, and Deep Introspection... while you soak in the deep peace of ancient pine-trees by the side of a spring-fed lake. Allow yourself to dream those dreams you've been waiting on or hiding, perhaps even from yourself - plant them now, in the energy of the new moon moving towards the light, and see what magical things begin to bloom in your life!! Come join us as we plant our seeds of inspiration, and take this step to create a renewable life for yourself and the planet- the ripples of light we create are greater than we imagine! 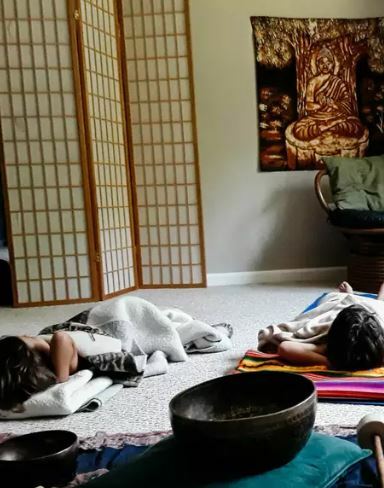 Yin Yoga with Louise Arguello, local yogini and healer: ~To bring our presence fully into our bodies and the feminine aspect of the New Moon, and begin to connect with our inner magic. Beautiful organic food and drinks: Tea, coffee, Green juice, a light breakfast, a warm nourishing lunch, and some hot cocoa and fireside treats. Sisterhood Circle and Guided Meditations by the Water to support, inspire, deepen your experience and share insights. 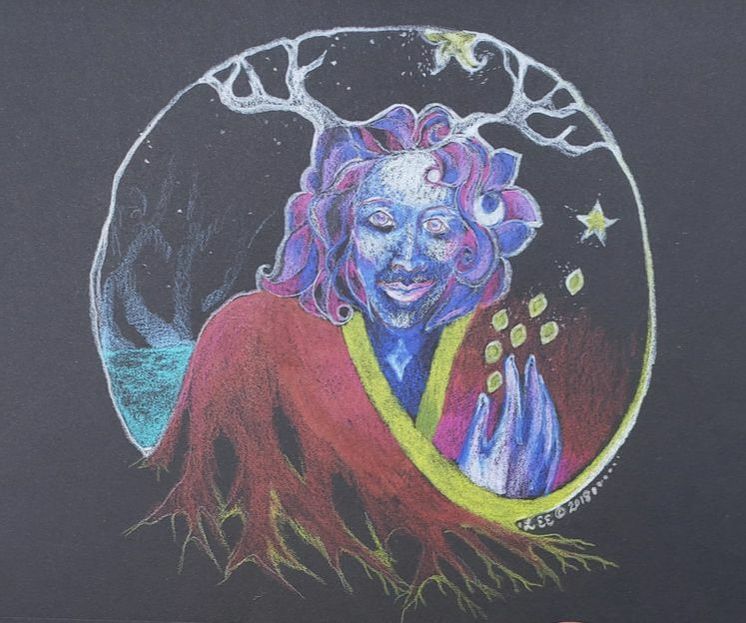 Tree-sitting and QiGong with Lydia Erickson, artist/writer, healer and women's ritual facilitator: ~In a beautiful grove of ancient pine trees, we will participate in a special QiGong practice passed down from Master Ni Huang Ching, called "Tree-sitting" for restoration and renewal. Lydia will incorporate healing sound and "Tree-singing" for self-healing, and we will complete by joining together at "Grandmother Tree" to give thanks to the trees. Listening to your intuition, Deep Introspection with Clara Angelina Diaz - author, speaker, and women's empowerment coach: ~To help you bring your dreams to reality through grounded and practical steps. For those who are drawn, there will be continued ongoing support through Self-Care Circle: keep yourself accountable to this sacred contract you have made to bring more joy, juice and You into your life!! Strengthen your core energy, receive healing and let your soul sing as you are embraced by the beautiful energy of these old trees! Come renew and restore yourself before we enter the busy-ness of the holiday season. This retreat offers you a strong foundation of energy to support you through the holidays and into the New Year by diving deep into these healing practices, fully supported by the balance of the Earth's cycles. This time of year, the energy grows more potent in evergreen trees and it is the peak time for the Tree-Sit Meditation, this beautiful energy-receiving meditation that is a natural way of "topping off your cup" from a source of unconditional love. That concentrated energy will fill you to the brim and give you the vitality you need to really enjoy this time of year from a place of self-trust and empowerment. I will use my voice, singing bowls and other instruments to help you relax and enter a dream-like state, then gently guide you into the magic inner realms of You, to explore your deepest places of strength, love and gratitude. Come prepared to be completely held and cared for physically, emotionally and spiritually. You will take a journey of inspiration within, as you receive the nourishing vibrations of healing Soundcodes through my voice, Tingsha, Tibetan singing bowls, mbira, and other musical instruments (including some surprises!). ​After the meditation and sound bath we will have time for tea and quiet conversation or solitude and journalling. You are welcome to wander our local trails to nearby ponds and lakes, or just to spend a little quiet time in the woods.